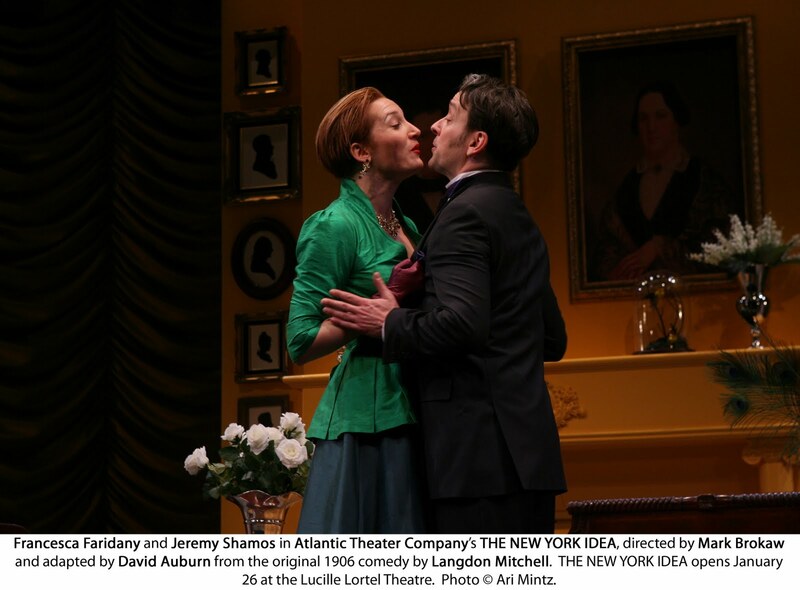 Lovingly resurrected from the dustbin of forgotten farces is the Atlantic Theater Company's delightful presentation of The New York Idea, David Auburn's world-premiere adaptation of a 1906 script from Langdon Mitchell. With a theme that was probably old even when the play first premiered, the devilish delivery, back-and-forth bantering and a very strong cast makes the entire escapade well worth seeing. Respected but divorced New York Judge Philip Philimore (Michael Countryman), a staid, proper and controlled fellow, is about to get married to Cynthia Karslake (Jamie Ray Newman), a bouncy, exuberant women with a love of horses, whose somewhat direct manner is quite off-putting to the Judge's aged mother (Patricia O'Connell) and aunt (Patricia Conolly). Both women feeling Cynthia, who is also divorced, is not a proper fit for polite society. As Philip and Cynthia are happily making final wedding preparations, Cynthia is horrified to learn that her ex-husband John (Jeremy Shamos) is selling her favorite horse, which the Judge becomes determined to buy as a wedding present for his intended. This results in John entering the picture where, despite Cynthia's loudly proclaimed reluctance to talk to her ex, or even be in the same room with him, it is quite obvious there is still an attraction between the two. Meanwhile the horse in question (Cynthia K), winds up the property of the Judge's ex-wife, Vida (Francesca Faridany), who is every inch the modern woman (if Cynthia is a like a breath of fresh air in a stuffy world, Vida is more like a raging hurricane). Vida is so modern that she demands her maid Jacqueline (Mikaela Feely-Lehmann) address her by her first name. It's not long before Cynthia finds herself in a bit of conundrum. Will she stick to her guns and marry the Judge, or go back to her ex-husband? Or will she perhaps run off with Wilfred Cates-Darby (Rick Holmes), John's friend visiting from London, who is delighted by the "modern" New York arrangements he sees going on around him. There's also the future of the horse to consider. More than a farce, the play quickly becomes a laugh riot not only because it sends up the staidness of society (such as when the Judge says how much he looks forward to spending time with Cynthia as they're both reading the morning paper), but also the over the top antics of the "modern woman" mystique, such as Vida's devil-may-care attitude and her trying to ride a hose for the first time. Faridany practically steals the show whenever she's on stage, endearing herself to the audience with a roughish heart of gold as she continually grabs life as hard and as fast as she can. In the same vein, the play shows that while one may be able to have it all, there are sacrifices one must make along the way, such as Cynthia deciding to marry Philip simply because he's the opposite of John. The play is also filled with some rather politically incorrect dialogue at points, showing a sort of window into a world of a time long gone (look for a remark by Cates-Darby regarding Wimbledon). Not to mention references to things and situations that no longer exist. Such as some amusing comments by the Judge when he's explaining the reasons for not having a telephone at home. Best of all are the characters themselves which are all played perfectly straight, making them that much more funny. In addition, all of them (the major ones anyway) are fully formed and interesting enough for the audience to care about them. Countryman is quite good as the no-nonsense judge who left Vida because of her wild ways (okay, he's boring), but as the same time, he loves Cynthia dearly. Newman is very enjoyable as Cynthia, a free spirit searching for a place to land, at least for a while. Shamos is fine as John, a failed lawyer and hopeless gambler. He's also a quiet and submissive sort of fellow, (audiences of the time would have called him deferential), yet a rock in his own way, getting into trouble whenever he puts his foot down, so to speak. Holmes is great as Cates-Darby, bouncing from girl to girl and having the time of his life in this strange country. Faridany is a delight as Vida (look for her line about a delicatessen number, which revolves around an incident which, ironically no truly modern woman would accept). Also enjoyable is Joey Slotnick as Philip's brother. Feely-Lehmann is funny as Jacqueline, John Keating is fine as the cockney horse handler Fiddler, and Tom Patrick Stephens is good as a butler who always seems to do or say the wrong thing. Adding a bit of highbrow class to the proceedings are the able talents of O'Connell, Conolly and Peter Maloney, the latter as the somewhat bombastic and blustering Sudley. 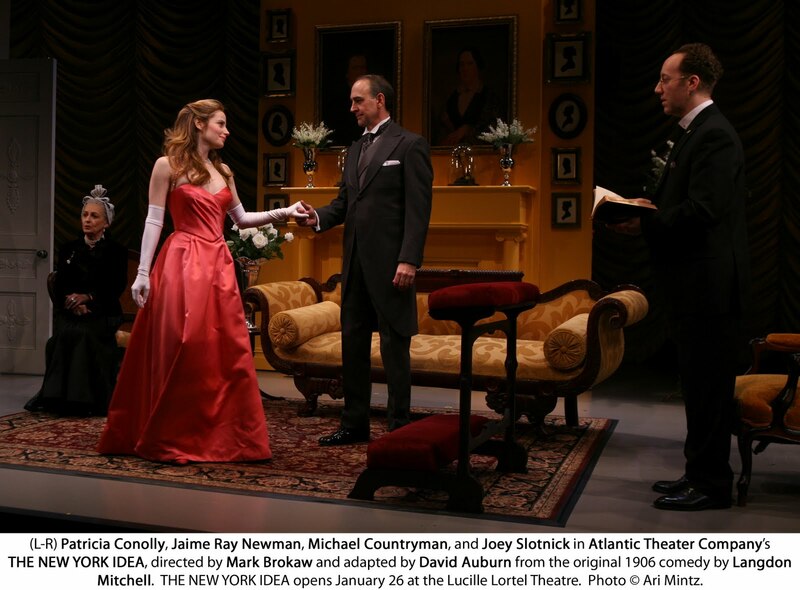 Mark Brokaw's direction works very well, with great emphasis on the nuisances of Auburn's take on Mitchell's original text, yet allowing the actors to have great fun with their roles. 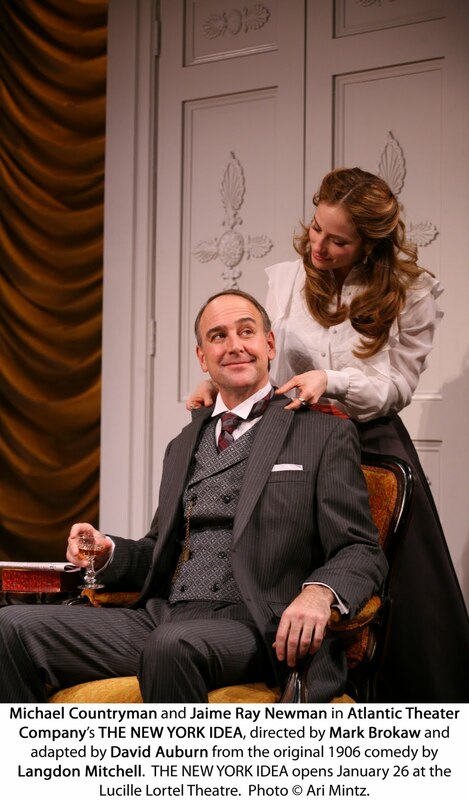 Costumes by Michael Krass are excellent, each fitting the various characters perfectly-from Vida ostentatious outfits, to the sharp suits worn by Philip, to the proper but lovely gowns worn by Philip's mother and aunt, to John's more slovenly garments. The only real problem is the set by Allen Moyer, which really doesn't do the play justice. Granted the Atlantic is not using its home base (it's under renovation), renting the Lucille Lortel instead, but the sets look like they were put up in a bit of a hurry and feel somewhat tacky, all of which diminishes the atmosphere of show as the characters would have only the finest materials in their homes (this is especially true for the opening scene in the Judge's house). Still this is minor quibble when the rest of the play is such a delight. Definitely place your bet on The New York Idea for a show you really should see. You'll come home a winner.